In the 1970’s there was a catchphrase that did the quiche’s reputation quite a bit of harm. ‘Real men don’t eat quiche’ some wag said and the phrase quickly became a cliche. I’m not quite sure what the saying was meant to imply but it certainly does pose many questions the most obvious one being what is a ‘real’ man? Quiches may have suffered some bad public relations in the last couple of decades and this could simply be attributed to the fact that many people did not know how to make a good quiche. Recipes vary but they are all quite simple and you can use frozen pastry if you don’t feel like making your own. The hardest parts are cooking the pastry and making sure the filling is set – I would also recommend layering ingredients with the egg mixture as this ensures a more even distribution in the finished quiche. The classic quiche is of course, Quiche Lorraine. 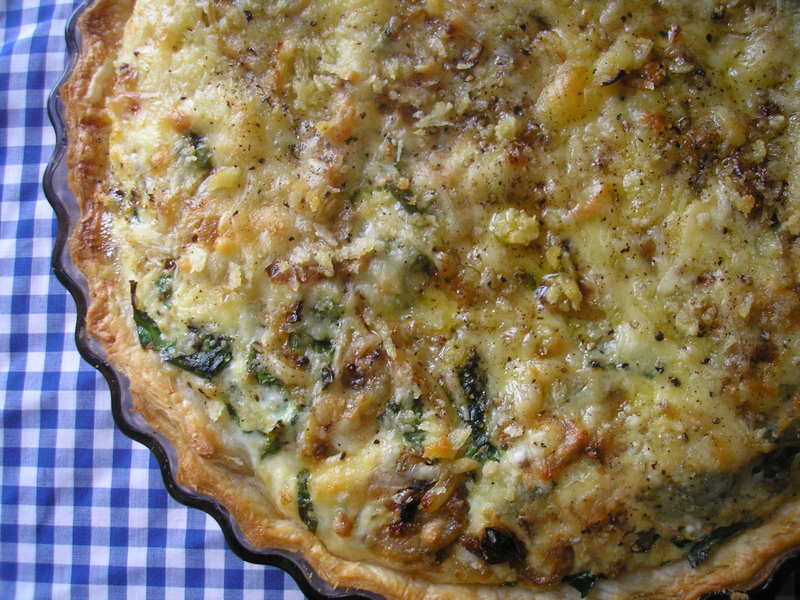 This is a rich, creamy quiche with bacon being the main flavour. The one in Julia Child’s Mastering the Art of French Cooking uses a ridiculous amount of cream so I have lightened it up over the years by using more eggs and milk to replace some of the cream. You don’t have to use bacon, the one I have made here is a cheese and leek quiche but you can use any ingredients you like as long as you follow the same basic method. Line a greased flan or quiche dish with pastry. Blind bake on the middle shelf in a 200°c oven for 10-15 mins. Meanwhile, place eggs in a bowl with the milk, cream, nutmeg, parsley and seasonings, whisk together lightly and set aside. Finely slice the well washed leek and the peeled onion. Saute in a preheated pan until translucent. Set aside. Remove pastry shell from oven and allow to cool slightly. When cool, pour a little of the egg mixture in the bottom. Put a layer of the leek and onion mixture on next and sprinkle with some of the cheeses. Pour over more egg mixture and repeat. Finish by pouring over the remaining egg mixture and sprinkling with the remaining cheese. Bake on the middle shelf in a 180°c oven for 30-40 mins or until the filling has set (be careful not to burn the pastry). Serve warm or cold.